I will not deny the popularity of the screen recording software as they have become rather famous over the past couple of years. The good thing behind the popularity is that it is there for several reasons instead of just one. Many people prefer using the software for recording educational videos like tutorials, while gamers benefit from some of the other features. 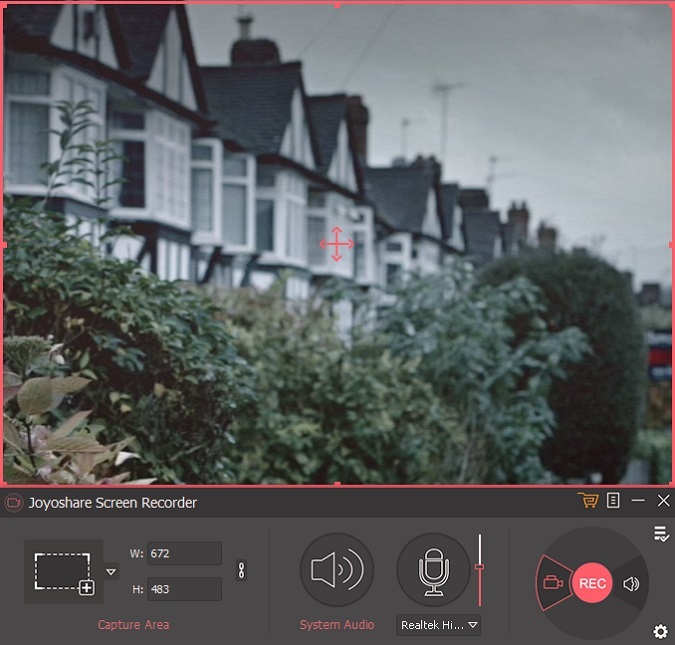 At the current moment, the market is saturated with all sorts of screen recording software, but one of the latest one to join the list is the Joyoshare Screen Recorder. You may wonder why one should consider this over the countless other options that are available, and I agree with you as well. However, upon spending a week with the software, I have finally realized why Joyoshare Scree Recorder is going to be my favorite screen recorder, and the daily driver as well. Screen recording software has been on the market for quite some time. Still, people seem to miss the entire point of having these tools. The simplest way to justify the use of screen recording software is that many people prefer to create tutorials or record their gaming experience for one purpose or another. Still, if you want more convincing, I am going to be talking about some of the benefits of screen recording software that should change your mind. Let’s look, shall we? If you are running a business where you have to inform the workers about the changes that are being made to the model, or the workflow, a screen recording software is definitely a good thing to use because that way, you can just record everything on your computer, and show it to everyone in a conference. Business is no the only place you can benefit from the screen recording software. As a matter of fact, you can benefit from it in schools, and colleges as well. Mainly be recording tutorials that you want to share with the class. It can really work wonders for you to be honest, and students will be able to pay attention as well. Not to forget, it can save you much of the time as well. While we are at the topic of discussing the benefits of screen recording software for educational purposes, or for businesses, let’s not forget gamers as well as YouTubers. Especially the ones who usually upload videos like “Let’s Play” series, or even the in-game tutorials, or regarding tutorials for programs. The Joyoshare Screen Recorder will make them feel right at home with some of the most impressive features that they will enjoy without feeling overwhelmed by useless gimmicks that no one even wants to use. Gamers can even record full-screen game captures if they wish to, and then edit, or upload them to whatever media they prefer to. That is how easy everything is with the Joyoshare Screen Recorder. The software allows you to record any area of your screen. The user can grab online movies and make a screencast out of them. The software comes with an independent working audio encoder with ID3 tags. You can create customized shortcuts that cater to you. Users can schedule the recordings as well. The Joyoshare Screen Recorder supports multiple formats such as MP4, M4V, AVI, MOV, FLV, WMV, SWF. The screen recorder also has a wide range of support for devices running iOS, Android, smart TVs, Windows phones, game consoles, and more. As with any screen recording software, the tedious process is the learning curve. Most of the users give up in the earlier hours. I found myself intimidated with the screen recording software at first, but after using it for a while, it hit me that this is, in fact, one of the easiest options available. Still, for the sake of keeping everyone educated, I am listing down an easy to follow tutorial that will help you use the Joyoshare Screen Recorder the way it is meant to be used. Start by downloading the Joyoshare Screen Recorder from here. Once the software is downloaded, install it in your preferred destination. Launch the software, and you will be presented with a UI that is clean, and minimalistic enough for everyone to understand. Once the screen recorder program is launched, the UI will be clean for you to understand. The left side of the UI will display the ability to select the area you want to capture; you can either choose the area using a scale or just input the height and the width yourself. The middle section will give you two buttons related to the ability to mute or unmute the system audio, and right next to it is the option of choosing the microphone device through which you wish to record your audio. 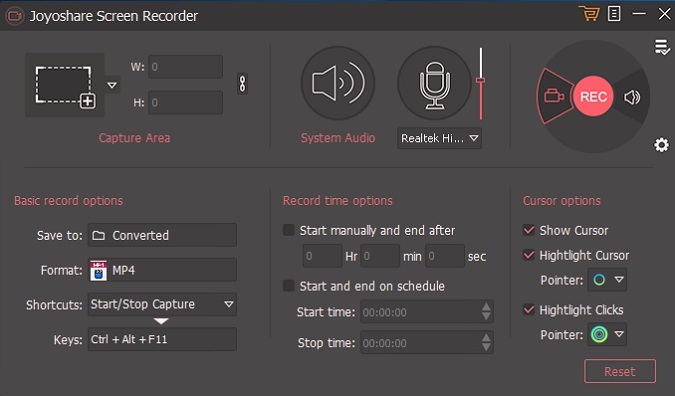 Lastly, the rightmost pane gives you control over the recording option like shifting between audio and video recording, the recording button, and the volume adjustment for your microphone. In addition to that, buttons for settings, and files are also located in the right pane. Once you have selected the area of the screen that you want to record, the process from that point is pretty straightforward. You just have to click the record button, and the recording will start. Once the recording begins, you will get options to pause, stop, or even cut the video while it’s in the middle of the recording process. You can record pretty much anything you like; ranging from Skype video calls, gameplay videos, YouTube videos, streaming movies, and even record your very own tutorials. The sky is the limit. I don’t think any screen recording software would be complete without a slew of advanced options that make the software as good as it actually is; this is a simple fact. Luckily, the Joyoshare screen recorder is outfitted with some of the best features you can get on a screen recorder. The user is allowed to save the videos in a slew of different formats, making the job much easier. In addition to that, you even get other options that allow you to customize your shortcuts according to the needs. This ease of access makes Joyoshare my favorite screen recording software as it has made my life much easier for the days to come. I must say that the ever so evolving world of technology is making people lazier in a way by providing them with the ease of access. Such is the case with programs that people are using. Gone are the days when you had to use several shortcuts just for the sake of getting to the required library. The management part of Joyoshare is even easier than the actual software itself, making it ideal for people who just want to have the best possible ease of access you can. Management on the Joyoshare Screen Recorder is top notch, and I don’t think it can get any better than it already is. In a market where there is a new software every other minute, it is hard for a new software to makes it place and stay there for a longer time. Yet, every now and then, we are presented with one piece of excellent coding, and programming that we have to stop and take a look at it. In today’s review, Joyoshare happens to be the case. The software is one of most refined screen recorders I have had the pleasure to use, and despite the fact that I used a trial version, I went ahead and bought the full version right after that. The reason being simple, I record videos when I am gaming and use them for later use, and the software has helped me achieve that in a very refined, and efficient manner. There are plenty of options to go about even if you are using just the free version, but if you want the experience to remain as refined as it was for me, invest in the full version, and you will not regret it after that. Plus, the company has an excellent customer support as well, so if you need any help regarding that, just contact them, and they will help you with it. My only complaint with the Joyoshare would be that the free trial only allows the user to record/capture videos of 1 minute. Extremely friendly with the computer resources. Free trial only allows 1 minute of video capture.